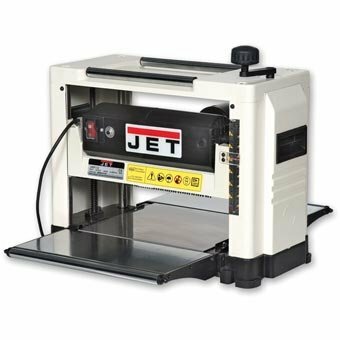 Designed especially for the hobby woodworker, the JWP-12 is compact and very capable. Its powerful 1,800W motor quickly removes material up to 2.5mm thick with each pass. The block is fitted with two resharpenable HSS blades and gives 18,000 cuts/min, this coupled with the feed speed of 7m/min ensures an excellent ripple free finish. The thicknesser is fitted with overload protection with a reset circuit breaker. The maximum depth capacity is 153mm with a maximum width of 318mm. Supplied with fold down table extensions with end rollers provide support for long workpieces. A 50mm diameter dust hood allows connection to a vacuum extractor. Perfect for small furniture projects at home.